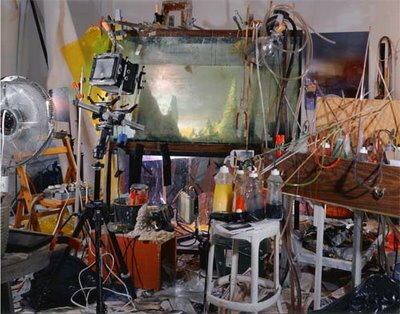 Short Take: Artist (former painter) who photographs imaginary landscapes constructed in a 100-gallon aquarium full of water, using plaster casts, colored lights, and clouds of various coloring agents (paint, ink, dye, etc.) injected into the water. Quote: "It's so much fun to see the paint clouds move through the water and it all starts to look so real, I feel like I'm watching a movie or I've been transported to this lilliputian world of my own creation. I guess I'm an escapist at heart." 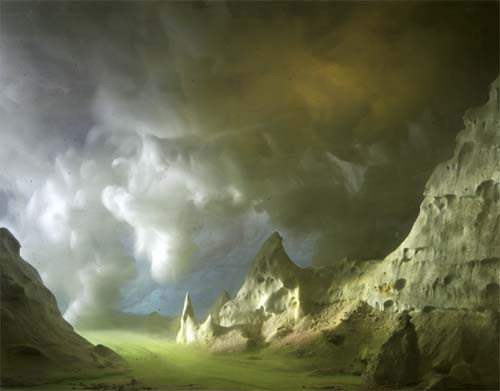 Critical Voice: "...Unabashedly handsome, even majestic, [Keever's landscapes] are nevertheless mysterious, moody and perhaps a bit malevolent (in a good way!). Wagnerian. Except there are no humans. We are seemingly either in a primordial Eden or a post-apocalyptic pastoral. People Who Don't Like Him: His downstairs neighbors, whose apartment he has flooded twice. Below, Studio shot showing Keever's working area. William Mortenson would be proud of him. Oh wow!!! Where did you come across this guy? Thats pretty awesome and original. I'd love to see those in person. Its like still life to the nth degree. Bravo! Very unique, interesting stuff. When looking at the images on the website though it seemed a few wear marred by stains on the glass and such and it was way too evident to see such. I would think that could be avoided? Obviously any marks that are appearing were intentional... I think if he wanted them clean he could afford the Windex. I like un huevo, wonderful.